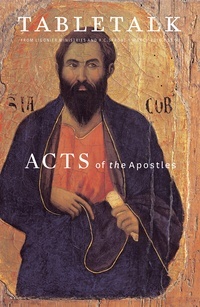 The March 2010 issue of Tabletalk will examine the main point and purpose of Saint Luke’s Acts of the Apostles. Contributors include R.C. Sproul along with W. Robert Godfrey, Fred Klett, George W. Knight III, Scott R. Swain, Brian Tallman, David VanDrunen, and Donald S. Whitney. Tabletalk features articles about topics central to the Christian faith and daily, in-depth Bible studies with featured columns by contributors such as Keith Mathison and Kim Riddlebarger.